Denton' TX band Midlake have been making complex, emotional rock (not to be confused with Emo) for the better part of a decade. On November 5th they'll release their latest effort, the 10-song Antiphon. The title track kicks off the album. It's a modern prog rock number with a big, soaring refrain. It's the kind of thing Muse might compose if they were ever able to control their urges to be self-indulgent. The record's highlight is "This Weight". The tumbling drumline demands attention and sets the tone for a vibrant, engrossing arrangement. An epic guitar run smack dab in the middle of "Vale" is a highlight wrapped up in otherwise ho-hum tune. Unfortunately, most of the album is ho-hum. Hum-drum even. "Provider" is detached and soulless. "The Old and the Young" is methodical and hypnotic, to the point of being irritating. Those are the worst offenders. Mostly the tracks are like "It's Going Down" and "Ages", intricate but having no fire in the belly. 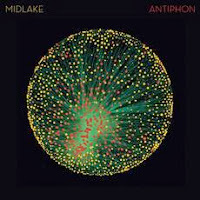 If you like moody rock with little melody, no hooks, and easily-ignored lyrics then Antiphon is definitely for you. For the majority though, it's simply a plodding monotonous waste of time. Best tracks: "Vale", "This Weight"